Eat, drink, and take home these authentic handcrafted goods today. Locals know how to roll up their sleeves and get making. 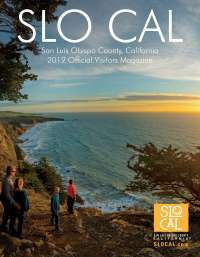 Perhaps it’s the long growing season and endless sunny days, but SLO CAL is home to some of California’s most coveted home-grown, artisanal goods. From fine wine and craft beer to goat cheese, honey, lavender and cocktail fixings, you can bet you’ll find small batch bounty made right here on the Central Coast. No need to scour the markets for these DIY delights. Here’s your guide to finding handmade goods in SLO CAL. Oh, honey! Wait till you try this. Small batch honey is a delicacy in SLO CAL, with producers like SLO Honey Co. in Atascadero and Jack Creek Farms in Templeton offer up golden globs as sweet as they are natural. Look for local honey at a slew of area farmers markets from Atascadero to Baywood Park. Lavender loves SLO CAL’s sunny days and unique soil. 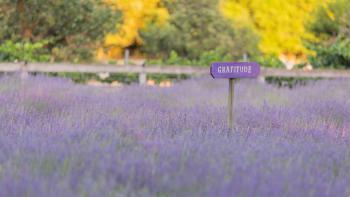 You’ll find satchels, tinctures, soaps and bushels provided by growers like Central Coast Lavender and Harmony Lavender (where you can even book a tour of these fragrant fields). Get Going: The Central Coast Lavender Festival heats up downtown Paso Robles July 7. Shop lavender goodies and even lap up lavender infused ice cream! A drink is never just a drink in SLO CAL. With handmade spirits and fabulous small batch cocktail accoutrements to choose from, there’s never a dull sip to be had! 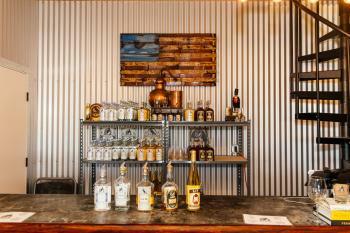 Visit the booming Paso Robles Distillery Trail, which includes Re:Find and KROBAR, known for unique gin, whiskey, and vodka. Many local distilleries use leftover wine grape juice as a base for their premium products, creating a smooth, approachable mouthfeel. Whether you prefer a barrel-aged bourbon or a fruity lemoncello, you’ll find it in SLO CAL. Better yet, you can take bottles home, including bitters from SLO Bitter Co., fizzy, all natural mixers from Root Elixirs, and syrups from Yes Cockstail Co.
Get Going: Find local spirits and cocktail mixers at local haunts like Sidecar, La Cosecha, Il Cortille, Blue Heron, Flour House, Luna Red, Novo, FARMstead ED and Thomas Hill Organics, to name a few. From expertly crafted wooden wall hangings and furniture to art and natural beauty products, SLO CAL makers always have their hands in new items for you to take home. Bring a piece of SLO CAL into your world and stop by the MoJo Flea and Maker’s Market, a pop up that features locally made goods, live music, and vintage finds. 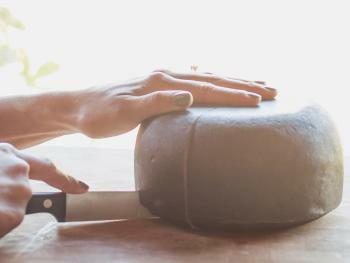 SLOcally Made, located in downtown SLO at the historic Muzzio’s building, features a collective of 20 local women makers who produce everything from baked goods to photography art, jewelry, candles, soap, clothing, cookbooks and more. Fine cheese is not just for European cheesemongers with fancy names! In SLO CAL, “gourmet” is an everyday occasion. Take a nibble or a whole wheel: Los Osos based Vintage Cheese Company features award winning goat’s, sheep and cow’s milk offerings (plus blends of these milks and flavors like sage and merlot cheddar). You’ll also want to dig into Central Coast Creamery&apos;s award-winning array of handcrafted, small batch cheeses made in Paso Robles. Be sure to try Holey Cow, Seascape and Bishop&apos;s Peak. Get Going: Tour Stepladder Creamery in Cambria and say hello to some of California’s happiest goats while also savoring cheese, honey and avocados. What can we say? We like it hot! If you reach for your trusty bottle of hot sauce every time you sit down for a meal (whether that be eggs, pizza, or even salad), we’ve got the fire to keep you coming back for more. San Miguel-based Gnome Hot Sauce is the Central Coast’s only smoked hot sauce made with farm fresh produce like carrots and beets. Spicy and slightly sweet Cayucos Hot Sauce is a local classic, perfect when paired with fish tacos from Cayucos hot spot Ruddell’s Smokehouse. Spice up your clam chowder with Splash Cafe&apos;s very own carrot pepper hot sauce. 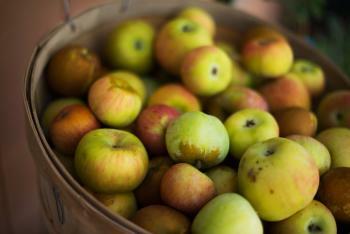 SLO CAL is home to See Canyon, an incredible apple growing region known for its consistently delicious bounty. It’s no wonder, then, that so many cidermakers have continued to craft crisp, satisfying hard ciders here. There’s longtime local standbys like See Canyon Hard Cider Company, bone dry Reef Points Cider, and newcomers like Two Broads Ciderworks, which you can find on tap at 7 Sister’s Brewing Company, Foremost Wine Company and Old SLO Barbecue. One thing’s for sure: There are no bad apples in this bunch. 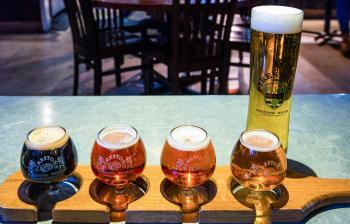 Get Going: Bristols Cider House in Atascadero is a laid back tasting room perfect for trying a range of English-inspired hard ciders made locally. You already know that SLO CAL is world famous for its award winning wineries, right? Even if you aren’t a huge wine fanatic, you can get in on the whole “sip, swirl swoon” scene, too. Don’t be intimidated! With around 250 to choose from, there’s a winery to suit your style and preference. From down home rural hangouts in Paso Robles to beachside wonders in Pismo Beach to elegant barrel rooms boasting sweeping views in Edna Valley your romp through SLO CAL wine will be diverse, to say the least. Craft Beer is big in California, but did you know that SLO CAL beers have been continuously ranked some of the highest in the nation? Central Coast Brewing Company has taken home a slew of national golds in the last few years (and recently opened a new, 10,000 square foot brewhouse and taproom in SLO). Big wins have also come to Silva Brewing and Firestone Walker Brewing Company in Paso Robles. There are now dozens of breweries to choose from in SLO CAL, including Toro Creek in Paso Robles, Three Stacks and a Rock in Morro Bay and 7 Sisters Brewing Co. in SLO. Sometimes you just deserve a treat. Put down the kale salad and head to one of SLO CAL’s legendary sweet spots to satisfy that sweet tooth once and for all. Brown Butter Cookie Company in Cayucos and Paso Robles is known for its addictive salty-savory buttery shortbread cookies you’ve just got to try to believe. The Cass House Cayucos also offers up baked goods each morning alongside fresh coffee and breakfast items. Sweet Pea Bakery in Arroyo Grande crafts cupcakes, macarons, biscotti, croissants and Danish to die for. Of course, we cannot talk about sweets without mentioning Madonna Inn’s iconic bakery, awash in pink and shimmery copper flair. Stop by the Copper Cafe for a slice of Pink Champagne Cake, seasonal strawberry pie, or a melt-in-your-mouth cookie made fresh daily. Craving a salty slice of salami? Whether you’re headed out on a picnic through wine country or just want to bring some gourmet munchies back to the hotel, Alle Pia Salami has you covered. The Atascadero charcuterie producer is known for handcrafted cured meats, including pancetta, coppa, guanciale, sausage, and salami spreads. Yum! Add any of these meaty morsels to your next cheese plate and take the flavor “wow” factor through the roof. Olives love growing in SLO CAL, thanks to our temperate, Mediterranean climate. Stop by Pasolivo in Paso Robles and sop up some bread with delicious, locally grown olive oil in flavor s like rosemary, garlic, and citrus. Want to tour a real working olive farm? 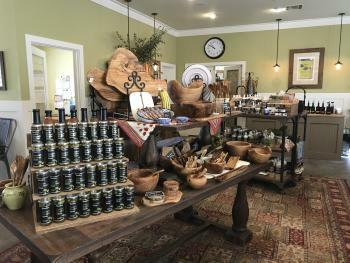 You can visit the Pasolivo farm in rural Paso Robles or head to Atascadero and for a stroll through The Groves on 41. Acres of trees await you at this scenic paradise. Just ask the owners (a friendly mother-daughter duo) to take you through the tasting lineup.